For this month’s IMBB challenge, hosted by Simply Recipes, I tried out a recipe for a Panna Cotta Parfait and Red Fruit Jelly from Patrick O’Connell’s Refined American Cuisine. When O’Connell makes this dessert, he uses a tall, skinny glass and layers both the jelly and panna cotta twice. For two reasons, I opted for only one layer of each. The first reason is that I really wanted to use the glasses pictured above. They come from a set of 8 gorgeous shot glasses (consisting of 4 pairs of distinct shapes). 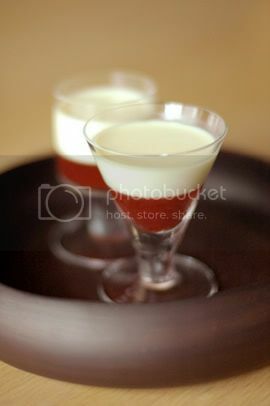 The glasses are small, so at most I could have set only 1 extra layer of either the jelly or the panna cotta. But the second reason, and the real reason I didn’t add that extra layer of jelly (which I had considered), is that O’Connell’s recipe was off—specifically, his gelatine measurements were incorrect. I’m not exactly sure what brand of gelatine powder O’Connell uses, but he must have some super-industrial stuff. After following his prescribed measurements, neither my red fruit jelly nor the panna cotta would set. His panna cotta mix, for example, called for a 1⁄4 teaspoon of powdered gelatine for roughly 500ml of liquid. (I’ve since compared that to another cookbook—something I should have done that day and stupidly didn’t do—and read a similar recipe calling for 1 1⁄2 teaspoon of powdered gelatine for 450ml of liquid.) I ended up having to ‘guestimate’ how much more extra gelatine I would need to add. I added what I thought would be right for each, but I still wasn’t confident that the panna cotta would set perfectly. So instead of risking creating a mess—I had visions of pouring the jelly liquid over the panna cotta and it all mixing into one pink sludge—I stuck with only one layer of jelly below and one layer of panna cotta. In the end, my panna cotta did set, but barely. Nonetheless, everyone enjoyed it, and my wife commented that she actually liked the panna cotta the way it was—very custardy and slightly runny. It made, she told me, a good contrast with the firmer jelly below. I’m not so sure she was right, but great wife that she is, she had only good things to say. –The IMBB #15 Round-up is posted here. i prefer strawberry to berry jelly too. its too bad you had trouble with the panna cotta, but this is a great idea! This looks dazzling. The glasses are very nice for this type of dessert. Also, the two layers are probably a good balance of flavours. A beautiful presentation of an elegant dessert. Yummmmmm. I love the presentation and the photography. Did you mention that all the glasses were different? The dessert sounds interesting as well. Thank you for sharing! hiya reid. yah, in the set of 8 glasses, every 2 are different. 🙂 they also come in a set with slightly taller stems, which are perfect for port and other post-prandials. A good chef will never turn down a compliment – even if it is from a spouse. Those glasses make for a stunning presentation. Hi chubby hubby – really lovely picture, as always. The recipe sounds interesting too! Keiko, coming from you, that is a high praise. Thank you. My wife and I were staring at your new post yesterday, drooling in admiration! another lovely photo … different shape of glasses makes an interesting contrast.